So, last Sunday, in the comfort of my cozy but modest Monmouth County, NJ abode I had the opportunity to really sit down without distraction and play in a handicapping contest worth something. The average American probably sat down to a day of NFL football on the couch or at a sports bar, but being a New York Jets fan and all, I figured I could DVR the game and cut down on 3 hours of potential ugliness. It proved to be a winning move on my part. Having accruing a decent amount of credit by winning pre-qualifier tournaments on HorseTourneys.com, I dipped my toe into the deeper waters of an NHC qualifier and cashed in for a $240 full-freight entry to a 12-race tourney featuring Belmont Park, Arlington Park, Churchill Downs and Santa Anita. Top two finishers would earn berths to the 2014 National Handicapping Championship (NHC) in Las Vegas. The first contest race, in hindsight, proved an early turning point for me, as in Race 7 from Belmont, 12.7-to-1 Winds of Bosphorous was nipped at the wire a half length by 13.9-to-1 Unbridled Logic. The $12.60 of place winnings was minor solace, considering I could have started the tournament with a nice ~$40 bankroll cushion. Still, I was off to a decent start -- better than most of the 73 other players in the tournament. Two contest races later, I needed no handicapping to land on Miss Behavior in Race 8 from Belmont, after having seen, in person, this impressive two-year-old filly rout the field in the Sorority Stakes at Monmouth on September 1. Miss Behavior was as visually impressive on Sunday, making easy work of the Grade 2 Matron Stakes at 3-to-1, putting me in 13th place through 3 races with a $24.10 bankroll. Next race, even-money favorite King David beat my choice, 5.7-to-1 Street Serenade, in Race 9 from Churchill, but $5.20 of place winnings moved me to 10th in the standings through four races. Not bad. Race 4 from Santa Anita was next up -- a difficult 12-horse, $20,000 maiden claimer, including an 0-for-25 five-year-old who went off as second choice around 4-to-1. This race was ripe for a long-shot, but even I, the connoisseur of long-shots, could not have backed the eventual winner -- 52-to-1 Marina Del Heat, a three-year-old California bred who lost her first four races by 22, 15, 19 and 7.5 lengths, respectively, and the next race stumbled and lost her jockey, Chantal Sutherland-Kruse. I landed on 6.9-to-1 Classic Candy, who had shown some speed (more than the others) in the past but lacked late kick, so I figured the addition of blinkers (an angle I like in bottom-level races) could help a bit for a horse who seemed to lose focus late in a few other starts. If nothing else, the other nags would get discouraged and quit at the mile-and-a-sixteenth distance, I thought. Instead, and at this point knowing I was entirely cooked, my horse darted to a 5-and-a-half length lead through the first half mile in 46 seconds before petering out very badly into the turn, only to watch Marina Del Heat blow by everyone for a commanding two-length score. Chantal, and two other HorseTourneys.com contestants (the latter to the tune of "cap" contest winnings of $42 to win and $22 to place), proved far braver than me when making Sunday's Race 4 selection. The loss not only made my decent contest start memory and set me roughly $35 behind the leader, but sent me a bit into earlier-than-anticipated "reach mode" and made me question aloud how anyone could have logically landed on Marina Del Heat. I suppose the law of averages says that, much like the few benefactors at the track who wagered real money on Marina Del Heat, at least one or two people in Sunday's handicapping contest would pick the horse, but a look at the horse's running line does not point to a single logical handicapping angle, in my view. 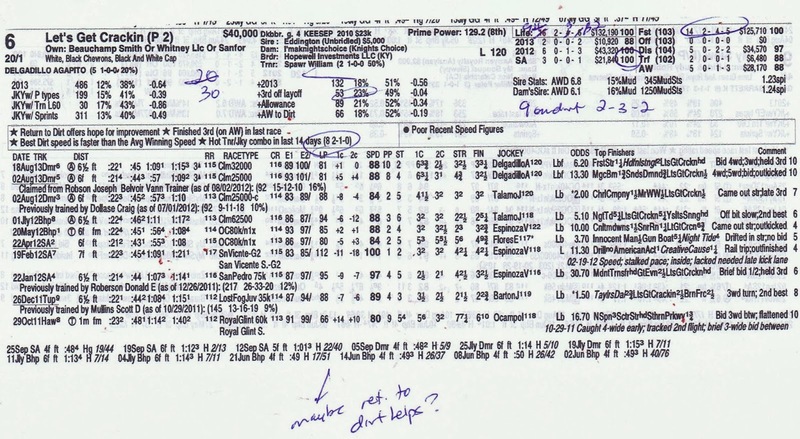 Maybe trainer Barry Abrams' 46% "in-the-money" finishes in a 13-race sample inspired, or the two contest players liked Chantal's 3-for-15 win rate on the early Santa Anita meet, or the drop down in class from more expansive nags, but otherwise the horse was totally a reach. Now, I was in far better shape than a lot of other players going into the second half of Sunday's handicapping contest, still in 14th-place after the Marina Del Heat shocker. Maybe it was too early to go that route, but three of those four race winners paid $6.80 or less to win; I rarely play horses that short on price in any handicapping contest. Going into the penultimate contest race, the John Henry Turf Championship Stakes (Race 8) at Santa Anita, I was off the page one leaderboard in 25th, some $60 behind the leader and in need of some bigger prices to make a dent in the standings. Teaks North made some sense, considering I thought 18-to-1 was a good proposition for a pretty sturdy and accomplished turf runner who could get the distance and benefited from a rail draw. As hoped, Teaks North tracked the lone rabbit, Slim Shady, but wilted late and was impressively beaten fifth of 12 by 2-to-1 Indy Point. Surprising, I was not technically eliminated from top-two contention going into the contest finale, Race 9 from Santa Anita, but I had to shoot for the stars. Race 9, a 6.5-furlong, $40,000 optional claimer for horse who had never won two races, facilitated my needs, however. #6, Let's Get Crackin (44-to-1). 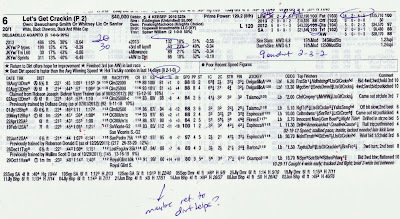 Now, maybe my decision-making would not have been the same had I been atop or near the top of Sunday's handicapping contest leaderboard, but the horse's running line included several positives that, as I saw it, made Let's Get Crackin an egregious overlay and a bad morning-line at 20-to-1 with an aggressive, experienced jockey (Agapito Delgadillo). It may be hard to decipher from my chicken-scratched past performances, but the first thing that caught my eye was that Let's Get Crackin boasted a career-best 100 Beyer at Santa Anita in the Grade 2 San Vicente in 2012 -- a fourth-place finish to multiple graded stakes winner Drill. I generally eschew Beyer figures in the claiming ranks, but 100 stood out against the majority of horses in the field, who generally competed versus lesser company and did not appear as quick on dirt. The exceptions were 9-to-2 Gladding, whose better days were in late 2010-early 2011, and 1.8-to-1 favorite, Wild Dude, an up-and-coming three-year-old but, in my view, grossly over bet, particularly just off his maiden-breaking score. Another bullish indicators in Let's Get Crackin's favor, and perhaps also indecipherable above, was an impressive dirt history. Let's Get Crackin was clearly not a play on current form against even weaker company, but those five efforts were on what I posited were unfriendly surfaces (i.e. grass and synthetic). Excluding the five all-weather and two turf races from the horse's history, Let's Get Crackin actually boasted two wins, three seconds and two thirds in nine dirt starts, and I speculated that the 0-for-3 (with one third) at Santa Anita was against far tougher fields than Sunday's $40,000 optional claimer. As scribbled above, "maybe the return to dirt helps." The return to dirt absolutely helped, and Let's Get Crackin ran away from the field for a nearly 3-length win over Wild Dude to increase my bankroll to $93.30 with a $64 cap payout ($42 win, $22 place). Now, an intriguing part about handicapping contest play -- at least to nerds like me -- is speculating what other players on the leaderboard are thinking. It's an inexact science, but mired in 26th place and needing a minor miracle, I tried to anticipate what players ranked 3-25 on the leaderboard might favor among the long-shots in the finale. Admittedly, I had to cross my fingers and hope those above me went away from my choice. Those closer to top could settle on a "safer" or "more-logical" horse like a Gladding or the other 9-to-2 co-second choice Derringer. A combined $15-$17 payout would surely be enough to catapult those closer to the top to a Las Vegas berth. Others in my situation or even worse would surely shoot for the moon, but which one would players favor? I figured Ranulf and Cast a Doubt alone on the trainer angle, and some players above me in the contest standings went that route. Solemn Oath took some bites as well, though I found that horse far fetched. In the end, four people above me in the standings took Let's Get Crackin. So Sunday's result for NJ Horseplayer was a 6th-place finish, good for 1,000 NHC Tour points. As an NHC Tour player, my goal is clearly to qualify for the year-end, $1.5 million NHC in Las Vegas. In four years as a Tour member, I have yet to win a qualifying tournament, and do not play consistently enough in order to normally consider earning a spot to Vegas through the Tour points standings. However, with Sunday's HorseTourneys.com qualifier marking my third point-getting effort this season, I am 184th in the NHC Tour points standings, just 400 points out of 150th. The 2013 Tour rules stipulate that the Top 150 in Tour points at year-end win berths to Las Vegas. There is still a lot of action left this contest season, including tomorrow's NHC Tour freebie, and although I do not anticipate breaking the bank in my bid to qualify for Vegas, I figure that two more decent point-earning finishes this season may be enough to get me in the back door (i.e. Top 150). Suddenly, Las Vegas no longer seems like such a long-shot.